Faster than a strolling crack dealer! More maneuverable than a mountain bike! 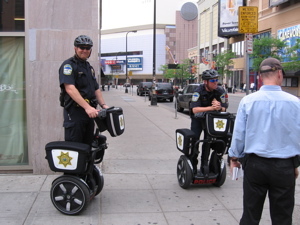 It’s cops on … Segway scooters?! 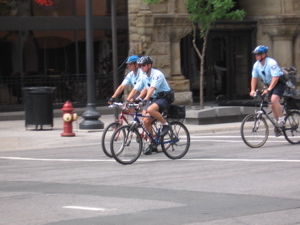 According to the officer facing the camera, the scooters can do about 12 mph–faster than most people can run, at least for sustained periods. A block down the road, I saw these guys using boring old human-powered transport. In a game of chicken, who do you think would win?